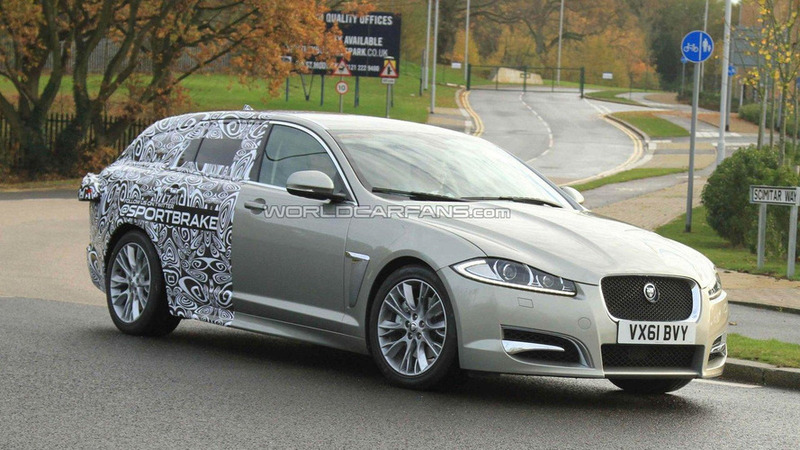 Wagon/estate variant of the Jaguar XF is sporting its name, 'Sportbrake', on the side of the prototype spied here. These are the first spy shots available of the 2012 Jaguar XF Sportbrake, caught while out for a test drive in Britain. How do we know that Jaguar will be calling the wagon/estate variant of the XF the Sportbrake? Well, it's written in bold type on the side the prototype spied here. There's also a message about following them on Twitter. Still, there's the camo trying to cover things up so Jaguar isn't giving everything away. But we can make out much of the rounded shape of the rear of this wagon model which gives the car a light, sporty look. The XF Sportbrake will be competing against some illustrious company such as the Audi A6 Avant and the BMW 5-Series Touring. The 2012 Jaguar XF Sportbrake is expected to make a debut at the Geneva motor show next March.